Ed Sheeran has been praised by a police force after he thanked officers for keeping his fans safe while he played a record-breaking run of concerts. The Shape of You singer performed to 240,000 fans over four nights at the Principality Stadium in Cardiff from Thursday to Sunday. South Wales Police posted a photograph on Twitter showing the singer taking a selfie with two officers. The message said: "Thank you Ed Sheeran for taking the time out to thank all South Wales Police Officers for their hard work in keeping his fans safe over the last four days." Sunday's gig was the last night of the 27-year-old's UK leg of his bumper Divide world tour before it returns to mainland Europe and Amsterdam on Thursday. Sell-out crowds of about 60,000 fans had packed the stadium in the centre of Cardiff for each of the concerts - including singing superstar Lionel Richie, who was spotted in the crowd on Friday. 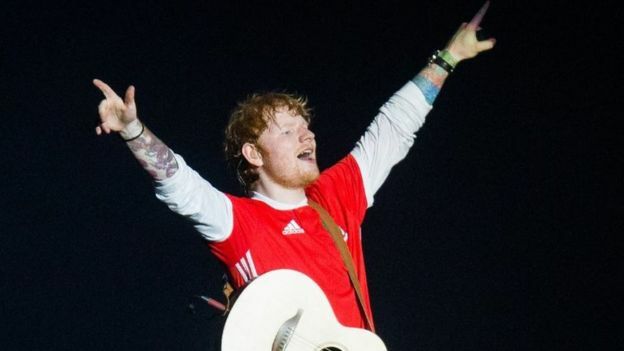 During his gigs, Sheeran spoke of his "deep love for Wales" and told audiences that after playing in the city on a previous occasion, he decided "I have to play at that stadium". The Principality Stadium tweeted to bid a "fond farewell" to the singer after his record-breaking run. It added that over the four nights, 135,000 bag checks had been carried out while 90,000 soft drinks and 14,000 hot dogs had been consumed. Sheeran had imposed strict rules for entry to his gigs in the hope of stopping ticket touts ripping off music lovers. His tour promoters said their system of helping victims had worked "perfectly" in Cardiff and that hundreds of fans had been helped with advice on getting a refund for invalid tickets. They were then able to buy replacement tickets at face value. Despite warnings that some trains would not be running after the concerts finished, it did not appear to cause fans major problems.